The past two weeks my students have finished their research, and now are moving into filming and editing their Mythbusters style video. 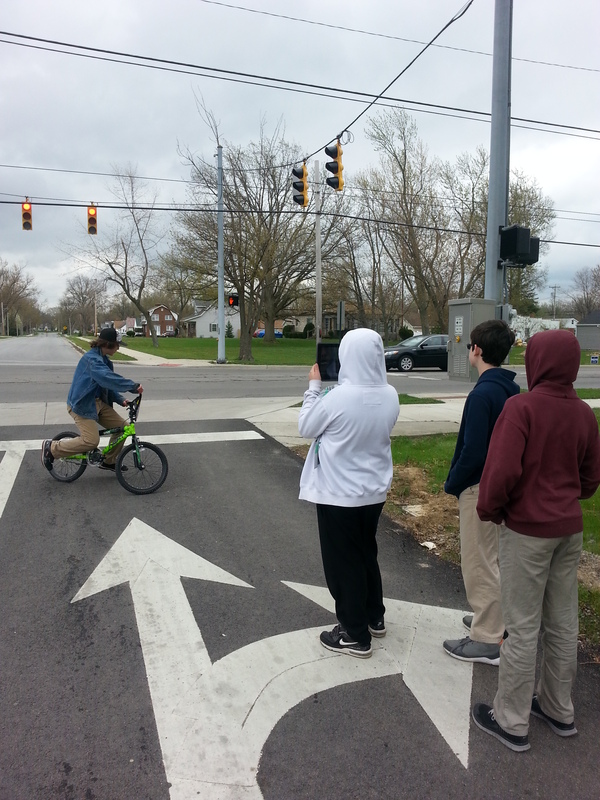 One group, who chose the myth that a bike could set off a light sensor, did most of the filming this morning. They wanted to get as authentic data as possible. So we had to wait until all the cars had left the driveway of our school to test their myth (which wasn’t easy). The students timed their peer riding a bike over the sensors for several minutes before giving up. We then used my van to drive over the sensors, and we timed to see when the light would change from red to green. It happened at about 50 seconds. Based on the information they gathered today they thought their myth was busted. Then we got a twist. I posted the above picture on Facebook with a description of what my students were doing. We were amazed that I got a response from a friend of mine. My friend told me that if the senor was readjusted to have increased sensibility then the bike would have set off the senor, and turn the light from red to green. My students went nuts! After hearing the news, my students went through their research and notes they took to try to come up with a way to understand the sensors a little more. We concluded that with that new piece of information that their myth was plausible. This is why I love Project Based Learning. You never really know where the project will lead you when you don’t know the absolute answer. My students got some authentic data, and they got an authentic real answer. All of their research was leading them to the fact it was impossible for a bike to set off a street sensor. My students were so excited to see that something they thought they could prove to be false has a slight chance of hope of being true. Project Based Learning is something that I am planning on continuing, because I feel that it gives my students a real chance of learning something real. It makes them critically think, and research and organize their work. They have the chance to see learning in action. They gained skills in interviewing, anylzing data, forming a thypothesis, and using critical thinking skills to come up with an answer. I believe these skills will be used by them after they get out of school and into the community. What are you doing to help give your students a chance at authentic real world learning? Have you tried Project Based Learning? If so what are some of your experiences? The last few weeks have been busy here. My classes are working on their Project Based Learning units. This one will be the last one of the year since we only have a few class meetings left before summer starts. Four of my classes are writing, acting in, and editing their Mythbuster’s Video project. The fifth class is designing a cross-country vacation for a family of four. The projects have been keeping me pretty busy. My Tuesday through Friday groups are in various places in their Mythbuster’s projects. We started to film last week on Thursday and Friday. I can’t wait to show those videos off to everyone. My students are working hard at it. My Monday group just wrapped up its vacation project. They have been planning on taking a family of four from Washington D.C to Seattle Washington with some cool stops along the way. I am impressed with what they came up with, and how they allotted their budget. On the burner now is the field trip that I am taking my students on in two weeks. We will be going to COSI in Columbus, Ohio. COSI stands for Center of Science and Industry. It is an awesome museum with so many hands-on activities for children and adults to do. I will post about this trip after it occurs. I should have a lot of pics and stories to share. Next week we will have our state exams, the Ohio Achievement Assessments. My students are somewhat nervous. Some aren’t. I continually encourage them to do their best on the tests. Generally my students do well on these exams. The one thing I worry about now is will there be enough growth from their previous year’s score. I don’t know, but we will soon find out. So, with just a few weeks before the school year is out, try to catch your breath. Enjoy these last few weeks with your students. I know I am trying. particularly with my 8th graders. I will miss them as they move on to the high school. I have watched these students grow from little 3rd graders into teenagers. I know they will be successful in the high school. I also know many will continue to keep in touch. How are you doing with catching your breath with all of the end of the year activities your school is doing before summer starts? Today has been full of surprises. The following is why I love to do Project Based Learning (PBL) in my Gifted Classroom. One group of my students is trying to figure out what kind of sensors we have in the road that triggers traffic lights to change from red to green or vise versa here in Lima. They researched two common types of sensors used around the United States: weight and magnetic sensors. They spent most of last Friday, and this morning coming up with interview questions to the Public Works Director. The moment came, and my student called the Public Works Director. The Director transferred him to the electricians who install the sensors. We found that the sensors in our roads here in Lima are mass triggered. My student was stunned. So he began to change some of his questions after the electrician described how they work. My student took down his number, and asked to call him back later in the day with a few more questions. The electrician has agreed. Now that is authentic learning. Sometimes you have to change what you are doing because of a new piece if information. Students don’t get that doing problems out of a book. The information was made real when he talked to the guy who installed the sensors. That guy knows those things inside and out. My student found that authentic learning is different from book learning. I truly believe he will not forget the feeling he got this morning having to adapt his questions so as not waste this guys time, but also how it felt to hear from an expert what these sensors are, and how they work. You can’t plan that. I think every classroom should have its twists and turns. Having that feeling of not knowing what to expect is so important. Not only for students, but for teachers as well. I have to tell you I was shocked by the student interview. He did a great job. He was polite, and was succinct. He let the Electrician know he was taking notes for a project. He did everything right that he practiced. He just didn’t know he and I were not on the right track.That’s education. The learning process is full of twists and turns. As I said, today has been full of excitement, and twists and turns. Students are learning. What I love about PBL units is that you never truly know what path it will lead you, or what part your students will be most jazzed about. But, when you find it you know it. What are you doing to encourage authentic learning in your classroom? When was the last time you were surprised by the outcome of an activity in your classroom?